"We are gay and we are here to stay." Lisa Licata and Sherry Lau of Penn Hills, Pennsylvania have taken a very colorful stand against homophobia. When they moved into their house five years ago, their next-door neighbors, Ron Makay and Iolanda Wieczorkowski, allegedly began harassing them with slurs like "dykes" and "homo." It escalated when, according to WTAE Pittsburgh, Makay allegedly shot the couple’s dog with an air rifle. The dog is now fine, but Police charged Makay with animal cruelty and they're due in court on September 20. Lisa and Sherry decided to put up a fence, and in an act of defiance, painted it rainbow. But their neighbors allegedly continued harassing them. "Our rainbow fence really ticked them off," Sherry told PinkNews. 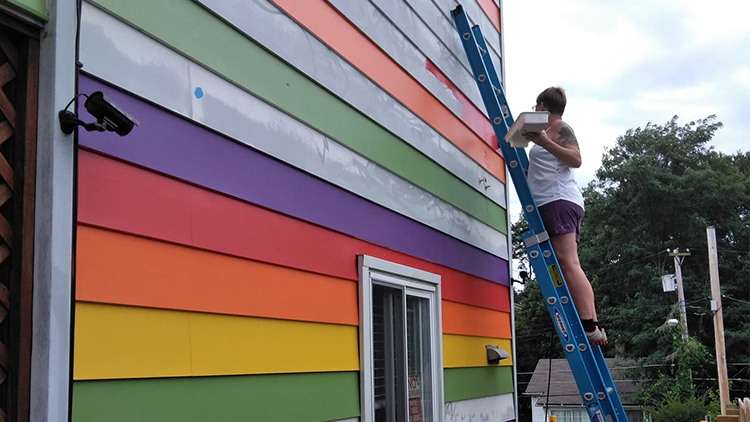 "Initially we were only going to do the fence, but when he complained to our municipality about our rainbow fence, and the hate continued, we decided to go big and do the side of the house that faces them." Some of the couple's friends pitched in to help them paint the house and the online support has been overwhelming. Sherry and Lisa now have plans to paint the whole house. "We are gay and we are here to stay," wrote Lau on Facebook. "Love is love! If our neighbor would have gotten to know us they would have seen we are really nice people. Instead, they passed judgment."